Win a free copy of Shana Mlawski’s YA fantasy Hammer of Witches. She’ll even sign it, with a pen! Hey, Overthinkers! 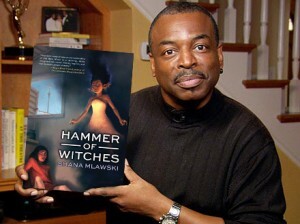 Would you like to win a free, signed copy of my book, Hammer of Witches? In case you haven’t heard, it’s a young adult fantasy novel set in 1492 Spain, and people really seem to like it. But as LeVar Burton always says, don’t take my word for it. You can check out the reviews on Amazon , Goodreads, or my website. So how do you win your free copy? We Overthinkers spent a bunch of time trying to think of fun Hammer of Witches-related contests for you all to enter, but we were never able to agree on one. Thus we will go the crass commercial route, because we like to eat food for energy. You can write something more cleverer than that, as long as you include the title of the book, @shanamlawski, @overthinkingit, and the link. And don’t be crass. We’re a family website. If you don’t have a Twitter account — OH MY GOD WHAT’S WRONG WITH YOU — I suppose you can like Overthinking It and Shana Mlawski on Facebook and write a status update along the same lines. Just be sure to tag me in the status so I realize you’ve entered the contest. I’ll draw for winners on Friday, July 19th at 6pm EST.